The 600F header with the floating cutterbar runs faster and cuts cleaner on uneven ground for reduced losses in down or tangled crops. The 600F is available from 6.10 m up to 10.70 m. While the design of the frame, drives, auger and stainless steel feed plates is similar to the 600R the flex technology completely different. It is not just a converted grain header with added flexibility on the cutterbar. The whole header is the result of decades of know how in soy bea and peas. Flexible cutting bar with a wide 152-mm (5.98-in.) range of floatation up and down for gathering more crop over the whole width of the cutterbar especially for cutting beans and peas and laying down crops. The in cab adjustable floatation pressure provides fast adaptation and reduces bulldozing in wet or loose ground. The HydraFlex system hydraulically controls the float of the cutterbar by the simple turn of a knob in the cab. This provides exceptional cutterbar flexibility throughout the entire working pressure range. Higher ground speeds can be accomplished with HydraFlex, compared to the conventional float systems. The operator can set the floatation pressure easily from the cab for different conditions. Float arms, with hydraulic cylinders at every other channel, have replaced the mechanical linkage. These cylinders provide the cutterbar with the ability to float over uneven ground conditions, with improved operator control. In automatic mode, the operator merely adjusts to a desired cutterbar ground pressure, and the system maintains this setting. If a different set point is desired, the operator simply adjusts the encoder on the armrest board, and an updated cutterbar float pressure reading is displayed on the cornerpost display. To make the cutterbar heavy to the ground for increased ground following in uneven terrain simply decrease the cutterbar pressure. If soil pushing occurs, simply make the cutterbar pressure to the ground lighter by increasing the cutterbar pressure. The 600F integrated cutterbar means there is no gap for your crop to fall through putting more grain in the tank and less on the ground also on uneven terrain. The integrated cutterbar has a low cut height of 38 mm (1.5 in.) allowing you to cut under down or low-growing crops once again putting more grain in the tank. The low profile of the skid shoes allows the cutterbar to smoothly follow the ground at a low cut height of only 38 mm (1.5 in.). 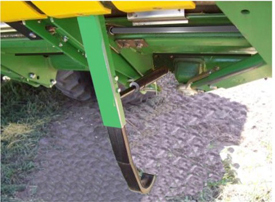 The skid shoes, cutterbar, and low-profile feed plates are integrated into the design to minimize gaps and grain loss. All while allowing the cutterbar to travel through a range of 152 mm (6 in.). The stainless-steel feed plates on the 600F Series Platforms have a flat profile. And a flat profile feed floor along with the stainless-steel material results in smoother feeding into the platform auger. The 600F offers an optional tall stone dam at the cutterbar to help prevent rocks from entering the platform. The stainless-steel feed plates have a flat profile that provides smoother feeding into the platform auger. The feed plates pivot from the rear. During normal operation, the profile of the feed floor is flat, which improves feeding geometry and also maintains a consistent clearance between the reel and cutterbar, allowing improved crop flow from the cutterbar to the auger. Tall 57-mm (2.2-in.) stone dam is available as a factory-installed option and is recommended where extremely rocky field conditions exist. The taller wall of this stone dam acts as a barrier to prevent rocks from entering the platform and the possibility of ingestion into the combine. The stone dam helps prevent unwanted objects from entering the auger. The smooth, flat surface of the stainless-steel feed plates improves feeding into the auger. The flat feed plates also allow a consistent clearance between the reel and cutterbar improving crop flow from the cutterbar to the auger. The 600F series cutterbar has DuraTwin coarse tooth deep serrated knife sections as base equipment to reduce stripping and tearing of coarse stemmed crops. A high strength, high wear boron treated knife guard works with the DuraTwin knife section delivering the ultimate knife system. The 100 mm (4 in.) double cut knife system allows faster ground speeds while keeping the drive system at 490 rpm increasing the life of the drive system. The double cut 100-mm (4-in.) knife system has a 1:1 ratio with the feederhouse back shaft speed. If the feederhouse is running at 490 rpm this will give the knife a 490 rpm or 980 strokes per minute. The double cut 100-mm (4-in.) knife system will provide 980 cuts per minute every two inches across the knife. The 600F uses a 660 mm (26 in.) diameter auger with a 660-mm (26-in.) pitch to the flighting resulting in 30 percent greater crop material handling than previous models. 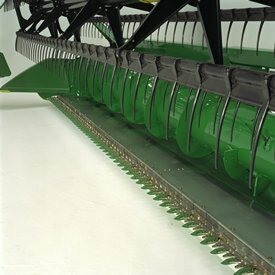 The four inline rows of auger fingers engage crop four times per revolution resulting in greater capacity and smoother combine operation. The 600F uses a 660 mm (26 in.) diameter auger with a 660-mm (26-in.) pitch to the flighting resulting in 30 percent greater crop material handling than previous models. Center auger fingers are in four inline rows around the auger. The auger fingers engage the crop four times per revolution. This provides improved crop sweep from the auger to the feederhouse drum, resulting in greater capacity and smoother combine operation. 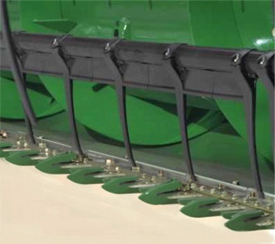 The optional header height sensors and a locking mechanism for the flexible cutterbar convert the flex header into a standard small grain header. Header height sensors for rigid mode are a field-installed attachment for the 620F, 622F, 625F, 630F, and 635F HydraFlex™ Platforms giving the header the ability to operate automatic header height sensing from on the ground to 330 mm (13 in.) off the ground. Using height sensing in rigid mode allows the 600F to operate the same easy to use way to maintain stubble height as flex mode does to follow the ground. Height sensors for rigid mode on the 600F are located in three positions, right, left and middle of the header to ensure accurate stubble length. The sensors are adjustable to allow up to 330 mm (13 in.) of maximum cut height. A cylinder with an internal spring keeps the following arm in contact with the ground to maintain an accurate cut height. The attachment is for use with 50, 60, 70, S-Series, W/T and S700 Combines only. The combines must be equipped with header height sensing. The sensors are compatible with combines equipped with the lateral tilt feederhouse. A rapeseed extension can also be fitted which makes this header a universal header eliminating the need for multiple headers to cut all different crops. The operator sets a target stubble height from the cab of the combine. The sensors give feedback to the combine and if the sensors are lower to the ground than the set point the feederhouse will raise until the sensors feedback are at the operator’s set point. If the sensors indicate too high, then the feederhouse will lower. If the combine is equipped with the lateral tilt feederhouse option then the feederhouse will move laterally to maintain a parallel cut height to the ground.